Jay Sonza, a veteran journalist and Duterte supporter, lays out the facts of the fight between the Duterte administration and the opposition and what the opposition is doing in order to get out on top. He says that in the areas of crisis management, as well as general multi-media services, the professional fee of usual public relations firms and individuals can be quite costly. He said that the smallest one can get is P1500, and the most is P5 million per month before broadcast. 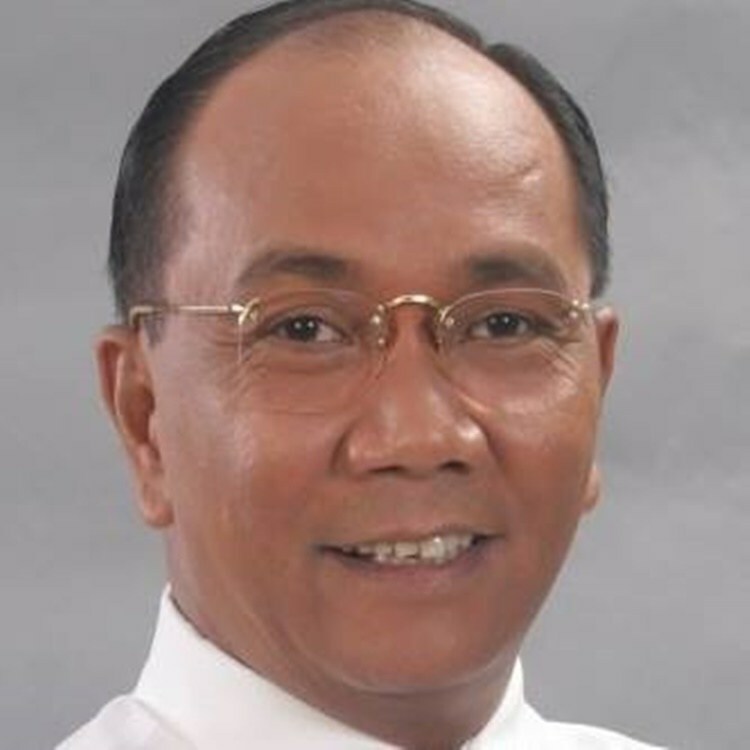 "Sa daigdig ng crisis management/image and multi-media services, ang pinaguusapan dito ay milyones bawat galaw. Opo, hindi po daang libo, kundi milyones," Sonza said. The compensation is very appealing which is why he understand why a lot of people choose to go into this business. Although he clarifies that he understands that not all people delve into this simple for profit. He says there are people who only genuinely want to help. But for those who do delve into dirty business, it does get rough and expensive. He admits that this is a sure way in order to help manipulate public opinion, and the pay is good. Which is why he warns people not to be shocked of this instance, but instead just simply be aware of the situation. "DON'T BE SHOCK. ITO ANG KALAKARAN NG MGA TUMATANGGAP. Magtanong kayo sa mga kilalang PR Operators. HINDI PO LAHAT AY NATANGGAP MERON PA RING NAMANG IILAN NA MATITINO," he said. The conduct of PR (public relations) campaign, with emphasis on vilification (paninira) efforts vs. Duterte is a VERY EXPENSIVE lot. Sa daigdig ng crisis management/image and multi-media services, ang pinaguusapan dito ay milyones bawat galaw. Opo, hindi po daang libo, kundi milyones. For example (bawat labas/issue/broadcast ito): reporter (P1,500 to 5,000) depende sa antas/kalibre o anggulo ng report; desk editor/deskman (P5,000 to 10,000) tabloid to broadsheets; news editor/radio-tv producer (5,000-10,000) depende sa papel o himpilan ng radio o television. 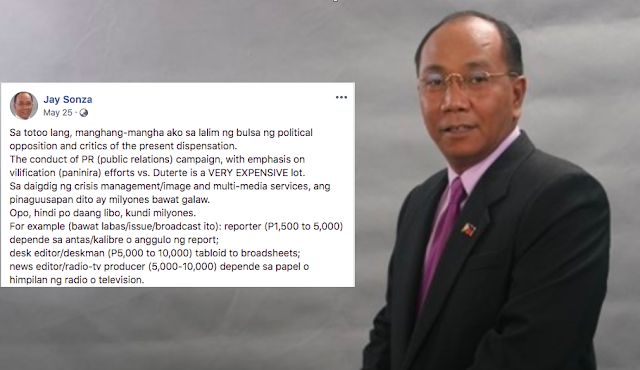 radio/tv anchor/presenter (usually pakete (package deal) ito (P1M-5M/per month/paid before broadcast iyan/advance palagi ng isang buwan) bukod pa iyan sa pa-interview (usually 30K to 50K per interview (depende saang network). Mayroon ding pa-ground floor ng heartbeat/Pegasus; mayroon pabili ng beres golf set at laro sa wack2; may painom sa lugar ni bobby v sa malate; mayroon din pangshopping sa hongkong o bakasyon sa Maldives. DON'T BE SHOCK. ITO ANG KALAKARAN NG MGA TUMATANGGAP. Magtanong kayo sa mga kilalang PR Operators. HINDI PO LAHAT AY NATANGGAP MERON PA RING NAMANG IILAN NA MATITINO. Kaya saan ka nakita na nakakulong at panay ang media releases with matching picture, icon o file video. Araw-araw may pa presscon si senador at senadora, may rally o mass action araw-araw (sukdulang dadalawampo lang ang nagmamartsa at para pareho ang pagkagawa ng kanilang streamers/placards at banners. may bayad na, may pa softdrinks pa.
bukod pa ito sa mala call center na sentro ng mga troll operation para sa new/digital media. puwera pa iyong stay home-only P20 per comment at P50 per counter-comment pag pinatulan nyo iyong troll sa facebook o tweeter nyo."